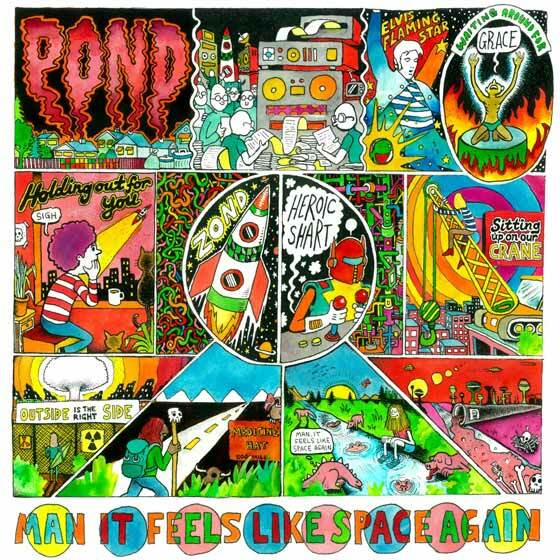 There couldn't be a more apt title for Pond's latest, Man it Feels Like Space Again. Reportedly uttered by guitarist Joseph Ryan while high, it describes both its glam rock-inspired spacey vibes and the literal space the Perth group have breathed into their music. Chalk up the more nuanced approach to an extended studio stay — two weeks as opposed to its predecessor Hobo Rocket's four days. Where that record filled the gaps with drums and guitar riffs, here the quartet work in plenty of Brian Eno-inspired synths. Nick Allbrook penned most of the songs on Hobo Rocket, but Space Again's nine tracks were primarily written by guitarist Joseph Ryan and drummer Jay Watson, whose different styles complement one another. Rather than pummel listeners, the funky, pulsing "Outside is the Right Side" sits comfortably next to Ziggy Stardust-esque "Medicine Hat," creating a 21st-century Roxy Music by way of Funkadelic hybrid we never knew we needed.